Which segments dominate Vietnam online marketing? The online advertising market in Vietnam is currently in its growth stage thanks to the increased use of smart phones and higher internet penetration in the country of nearly 100 million people. 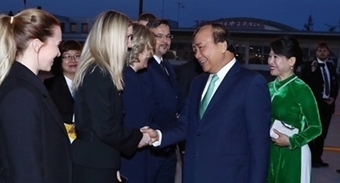 The Vietnam Chamber of Commerce and Industry (VCCI) and the U.S. Agency for International Development (USAID) on March 28 jointly launched the 2018 Provincial Competitiveness Index Report (2018 PCI Report). PSNews - On March 26th, 2019, Lumitel - the brand name of Viettel Group in Republic of Burundi, Africa celebrated its 4th anniversary of the official service provision. Dien Bien province’s department of Industry and Trade held a press conference in Dien Bien Phu city on March 25 to announce plans for the upcoming international trade fair of the north-western region – Dien Bien 2019. The central province of Quang Tri is on the track of finalizing key wind and solar power projects in a bid to raise its total renewable power generation capacity to 6,000 MW by 2025. Vietnam’s total trade turnover amounted to US$100 billion between January and March 19, according to Vietnam Customs. Vietnamese consumers are embracing digital payments as a faster and more convenient way to pay, with consumers using their credit and debit cards more often for in-store and online purchases, digital payment methods provider Visa said recently. VinSmart Company of Vingroup on March 20 officially announced the distribution of Vsmart smartphone models in the Spanish market through the number one European consumer electronics retailer - Media Markt. Vietnam’s luxury residential sector remains an attractive option to international buyers, regardless of the fact that growth is slowing for luxury home prices across the world’s major cities, as noted by a global real estate services provider. Three Taiwanese-funded enterprises on March 21 signed deals to invest a total of 30 million USD at the Minh Hung Sikico industrial park in the southern province of Binh Phuoc. PSNews – According to the Ministry of Planning and Investment, Singapore runs 2,169 foreign direct investment (FDI) projects, valued at 47.9 billion USD, in Vietnam. The central province of Quang Tri is promoting the application of high technology in the cultivation of pepper trees, one of the three main industrial crops of the province, in order to meet standards of the US and the EU.